Gov. Michelle Lujan Grisham is proposing $60 million more this year for early childhood education — part of a five-year plan to make access to preschool in New Mexico available to all 3- and 4-year-olds. 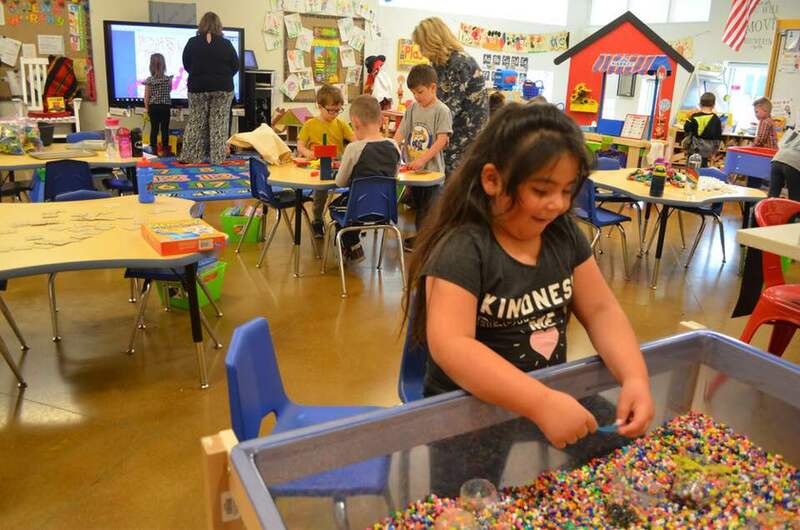 Legislation has been introduced that expands the prekindergarten program in public schools and adds preschool classrooms to the school building fund. With a $1.1 billion surplus to ease financial pressures, both the governor and Legislature are proposing a huge boost in dollars meant for public schools. Given all that, does it still make sense to pursue the long-fought goal to tap the $17.5 billion Land Grant Permanent Fund to help pay for early childhood education in New Mexico? The governor, for one, says yes. New Mexico’s moonshot for education finally has someone permanent at Mission Control. Gov. Michelle Lujan Grisham on Thursday named Karen Trujillo as her secretary of education, along with a diverse leadership team that has as its mission transforming the state’s beleaguered public school system to educate children better — and finally erase the achievement gap for at-risk students. The New Mexico State University education researcher and newly elected Doña Ana County commissioner has two credentials whose lack dogged Martinez appointee Hanna Skandera — she’s a native New Mexican and spent years at the front of a classroom. And she and her husband, Ben Trujillo, sent their three children to public schools. She also struck a different tone than former governor Susana Martinez’s education secretaries. On Tuesday, there was a pronounced note of positivity for legislators in the Democratic majority as they grasped the opportunity to move on long pent-up agendas with a Democratic governor. It’s honeymoon time. And they came to opening day of the 2019 legislative session ready to play. Gov. Michelle Lujan Grisham, a three-term congresswoman and former longtime cabinet secretary in state government, has repeatedly trumpeted her hopes for New Mexico to make a “moonshot” for education in her first session. But in a 50-minute speech Tuesday it sounded like she was shooting for the moon, too. The challenge is clearer than ever: A judge has ruled that New Mexico – once again ranked last for child well-being – fails to provide its children with a sufficient education, and must do better. Fortunately, after years of austerity, lawmakers expect to have more than a billion new dollars to allocate this year, along with a new governor who brings a fresh mandate and agenda. A policy window is opening, and substantial change is possible. During this special moment, lawmakers should prioritize early childhood. The science is clear – the first years of life set the brain’s foundation for future success in profound ways, and reliable access to care and education supports family economic and educational attainment. Education comes to a head in 2019: Will lawmakers pass the test? But it’s unclear how Lujan Grisham and the Democratically controlled Legislature will respond to Singleton’s gauntlet. Even with a $1 billion surplus, top lawmakers are saying there may not be enough to satisfy every education need this year. Lujan Grisham suggested the same in mid-December, as she listed a litany of needs her administration is inheriting from Republican Gov. Susana Martinez’s administration. A person would have to live under a rock to have missed New Mexico’s gilded fortunes over the past few months. You have to go back years to find New Mexico sitting on more than a $1 billion surplus. In a normal year, the historic windfall would provoke dueling choruses: fund what you can while you have the money versus save the money for a rainy day. But 2019 is not a normal year. The dueling choruses will still try to drown each other out as lawmakers meet in Santa Fe to draft a state budget. Gone are the days of chalkboards – and even whiteboards – in schools. The Las Cruces Public Schools district has slowly transitioned into using more technology, such as Promethean boards — fully digital smart screens that can connect to a computer to be used as a projector or writing board. And class textbooks and curriculum in many cases are fully online. That means students need access to the internet and a computer to do schoolwork, which is a challenge for many in Las Cruces. Twenty-two percent of LCPS students don’t have an internet subscription, meaning no data plans, broadband or any other type of service, according to 2017 data from the U.S. Census Bureau. January will mark two years since Lynn Middle School in Las Cruces re-imagined itself. A walk around classrooms and its cafeteria reveals signs of the metamorphosis. On any given weekday students drop in for healthy snacks or warm clothes in the school’s community room. Parents have access to computers, WiFi and office supplies to apply for jobs. Families and neighbors stop in for staples at a monthly food pantry operated by Roadrunner Food Bank. Amber Wallin is all about the numbers. After all, she manages New Mexico Voices for Children’s annual Kids Count databook and oversees the organization’s research and policy work. But there is one number she had never tallied before: Her ACE score. The second annual Southern New Mexico Kids Count Conference held Wednesday in the Las Cruces Convention Center put its focus this year on childhood trauma and preventing Adverse Childhood Experiences, something that affects New Mexico kids at the highest rate in the nation, and which can have lifelong effects on physical and emotional health, and learning. Her total: five ACEs. Editor’s note: This column is part of NMID’s weekly newsletter. Sign up here. I’ve always loved that analogy from Supreme Court Justice Louis Brandeis that “states are the laboratories of democracy.” I like the notion that great ideas and different ways of doing things can bubble up from the bottom and change the way the world works. I was a young copy editor in San Jose, California, when a former roommate told me I should try this great new search engine, “Google,” to look for things on the internet. (OK, I can’t help myself.